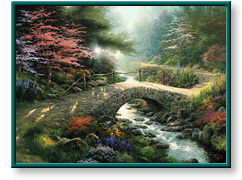 Bridge of Faith and other artwork by artist Thomas Kinkade can be viewed in our artist slideshow. Bridge of Faith by artist Thomas Kinkade and other Thomas Kincade art, art work, artwork, canvases, giclees, images, limited editions, open editions, paintings, paper, pictures, posters, and prints can all be found at Christ-Centered Art. "For me, the world is enriched by images of faith. In my Garden of Promise series, I look deep into myself for those moments of revelation, of joyous acceptance, that comprise our common spiritual experience. Then I look out into the world to find visual images that reflect the truths of my walk with God. "The Bridge of Faith is old and worn, but it is built of stone and it rests on a massive, unshakable rock. It crosses a stream fragrant with flowers; on our side the world is shrouded in shadow, but in the distance there shines a heavenly light." This unframed limited edition paper print comes mint in its original folio, includes a genuine certificate of authenticity from Lightpost Publishing, and is individually numbered and hand signed by the artist Thomas Kinkade. This unframed limited edition paper print comes mint in its original folio, includes a genuine certificate of authenticity from The Thomas Kinkade Company, and is individually numbered and hand signed by the artist Thomas Kinkade. This unframed limited edition canvas print comes mint in its original packaging, is stretched on wooden stretcher bars, has a genuine certificate of authenticity from Lightpost Publishing, and is individually numbered, hand highlighted, and hand signed by the artist Thomas Kinkade. Bridge of Faith by artist Thomas Kinkade as well as other open and limited edition inspirational paper art prints and canvases, giclees, images, lithographs, paintings, pictures, posters, and reproductions by renowned Lightpost Publishing, Media Arts, and The Thomas Kinkade Company artist Thomas Kincade can be viewed and purchased at special sale prices at Christ-Centered Art.